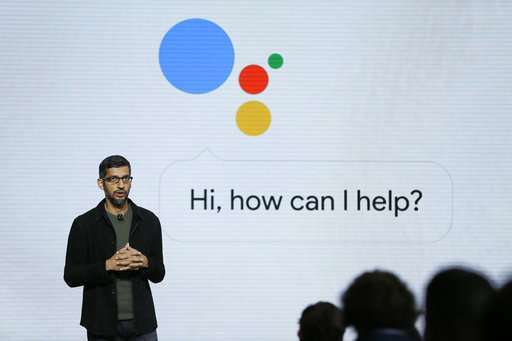 Google is likely to again put artificial intelligence in the spotlight at its annual developers conference Thursday. The company's digital concierge, known only as the Google Assistant, could gain new abilities to handle tasks such as making restaurant reservations without human hand-holding. The search giant aims to make its assistant so useful that people can't live without it—or the search results that drive its advertising business. But it also wants to play up the social benefits of AI, and plans to showcase how it's being used to improve health care, preserve the environment and make scientific discoveries. CEO Sundar Pichai probably won't emphasize privacy or data security concerns, which have put companies like Facebook, Twitter and Google in the crosshairs of regulators. But Google could also give parents new tools to manage how children access video and other material on different devices. Google also last week updated actions that its assistant can perform on smartwatches powered by its Wear OS software. For instance, it can tell you about your day if you're wearing headphones instead of making you read your calendar.